Infinite Dreams’ Jelly Defense [$.99] is a well-made by-the-numbers tower defense joint with an embarrassingly unorthodox and captivating art direction that arterially informs and fleshes out its otherwise boring core mechanics. Without this direction it’d look and feel as flat as a modern FPS, but its detail, vividness, liveliness, and the raw skillfulness employed in making it this way morph it into an experience. Conventional tower defense games are demanding, punitive, and scripted pretty harshly. You usually have to “get” the vision the designer had in mind for levels, which leaves a lot to be desired from a play perspective. Jelly Defense doesn’t depart from these norms, nor does it do much to differentiate on any other level outside of its look. You build towers. Those towers fire on specific enemy types and have certain effects on them as they crawl towards an ultimate end goal. If they reach the goal enough, you lose. If you pick bad towers, you lose. If you try to be unconventional, you lose. If you spend poorly, you lose. There’s a lot of losing in general until you understand and execute on proper placements, upgrade paths, and memorize the order of waves. Tower defense does have its charms, though. As punitive as it is, you gotta love the blood-pumping splendor of successfully completing a level without losing any of your goal, which in this specific game, are stars. I also appreciate the simple pleasures of memorization and execution, as well as the frenzied “should I upgrade this or this or put this here” thought progression that happens in every level, this game included. I haven’t spotted any meaningful refinements on the TD formula on display in Jelly Defense, but there are some noticeable subtleties in the towers, enemies, and levels in general that make it stand out a little bit. Your team, the jellies, are composed of wavy lifeforms that jiggle to and fro and shoot adorable little bolts of lightning and big old cannonballs out of oddly placed holes or antennae. The other team, also made out of jelly like material, come in all shapes and matters of form. They’re often differentiated by reds and blues, which ties into a core mechanic — colored towers can effect only like-colored enemies. It’s a neat touch, as are the contrast-catching greyed out levels and their wavy, jelly-ish design that has enemies bumbling and swaying down paths instead of lumbering in straight lines. Levels are divided up pretty well in small, instance-based missions with a point. Special boss conflicts, standard wave-based play, and constricting scenarios like, say, Enemies Don’t Drop Loot, all play out inside a world map-ish 3D structure. The map in particular is a great touchstone for the thing Jelly Defense has in spades: character. The map has this super distinctive, almost… child-born doodle feel to it that compliments the overall playfulness and vividness of everything else in the game. It’s a charming world with charming characters and it looks fantastic on the iPhone and iPad. This isn’t a technical beast, but it’s easily one of the most impressive looking games on the App Store. It almost reminds me of how Wind Waker caught the eye with its starkly different look and feel without having to be some sort of graphical juggernaut. But it’s still surprising how well Jelly Defense runs. It’s as smooth as butter, even when the action gets intense. Also, it plays well as a native game — drag and drop controls, as well as simple touches and swipes control nearly everything. As you’d hope to expect, but don’t always get, it doesn’t feel like a game in a genre originally created for a mouse and keyboard. 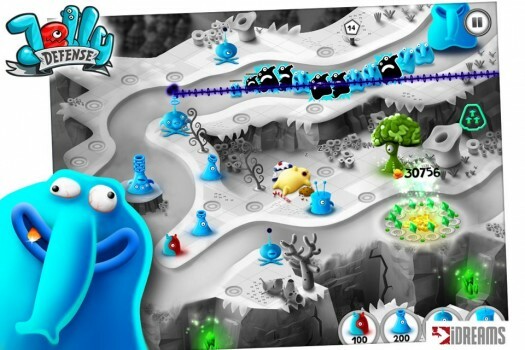 The App Store is clotted with tons and tons of tower defense games and Jelly Division doesn’t have a mechanical spark that differentiates it from most others. 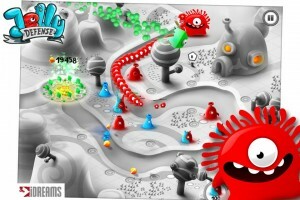 It is however a decent-enough tower defense game with an utterly fantastic look and vibe. Its art alone is worth the price of admission, but the game part holds up alright despite the orthodox approach.